Purlin anchors offer solutions for wood-to-concrete and concrete-block connections which satisfy code requirements. The HPA offers the highest capacity in concrete. The PA’s dual-embedment line allows installation in concrete or concrete block. Use all specified fasteners; some models have extra fastener holes. See General Notes. Purlin anchor must hook around rebar. Allowable loads are for a horizontal installation into the side of a concrete or masonry wall. Strap may be bent one full cycle (bent vertical 90° then bent horizontal). PA51/PA68 — for additional length, an MST strap can be attached using 1/2" bolts through existing holes. Refer to technical bulletin PA Foundation Straps for Uplift Resistance (T-PAUPLIFT) for additional information. Edge Distance — minimum concrete edge distance is 5". Minimum concrete block left-to-right edge distance is 20". ... Diaphragm to structural wall anchorage using embedded straps shall be attached to, or hooked around the reinforcing steel or otherwise terminated so as to effectively transfer forces to the reinforcing steel. A one-page technical bulletin describing how PA straps can be used to provide uplift resistance and anchor wood framing to a footing in pier and curtain wall construction in high wind areas. Deflection listed is at the highest allowable load. Nail quantities are based on Douglas fir (DF) or equivalent specific gravity of 0.50 or better. For use in spruce-pine-fir (SPF) or hem fir (HF), nails quantities shall be increased by 1.15 to achieve loads listed. For wall anchorage systems in SDC C-F, the maximum strap allowable load shall not be less than 1.4 times the ASD anchor design load. Minimum center-to-center spacing is 3x the required embedment — i.e., standard installation is based on a minimum 5" end distance. Structural composite lumber beams have sides that show either the wide face or the lumber strands/veneers. Values in the tables reflect installation into the wide face. Concrete shall have a minimum compressive strength of f'c = 3,000 psi. PA models installed vertically in the top of a grouted masonry wall with 6" embedment and (12) 0.148" x 3" nails achieve an allowable uplift load of 1,890 lb. 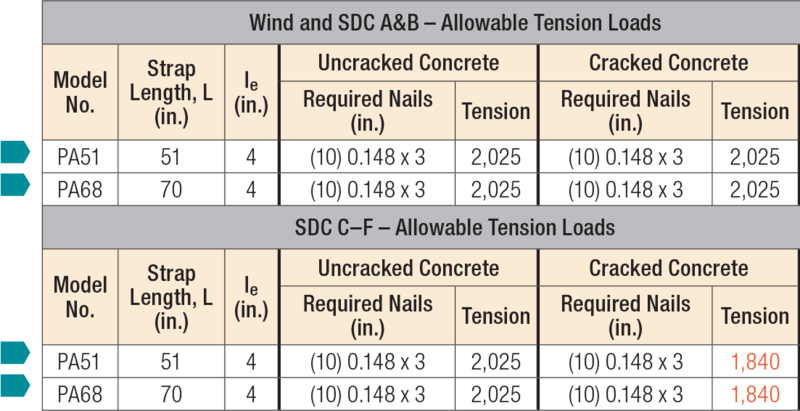 For PA models, 0.148" x 1 1/2" nails may be substituted for 0.148" x 3" nails at 100% of listed load and with a 15% increase in deflection. For installation over sheathing, use 3"-long nails minimum. Masonry applications require grout-filled CMU with minimum compressive strength of f'm = 1,500 psi. Deflection at highest allowable load is as follows: PA51 and PA68 = 0.10". PA allowable lateral loads are F1 = 795 lb. and F2 = 280 lb. Strong-Drive® SD9 x 1 1/2" Connector screws may be substituted for table fasteners with no load reduction. HPA See specific model numbers for code listings. PA See specific model numbers for code listings.